The thing I love most about fall is that its not too hot or too cold. Its the perfect mixture of easy breezy weather. Today it was 70 degrees in NYC, and I am enjoying it while it lasts. Black denim is on my list of my fall wardrobe staple items. The classic black skinny jean in particular is a must have. I’ve been on the hunt for a pair for awhile now and finally I found them. I love the skinny leg and flattering fit, which gives my look a sleek finish. I like to pair dark denim with a pop of color. People commonly assume that your fall wardrobe has to be filled with dark colors and earth tones. But, color can bring life to any assemble. This cropped neon sweater is just right for a nice fall day. Wedges are the perfect summer to fall transitional footwear. The are not as open as a sandal, but not as closed as a boot. 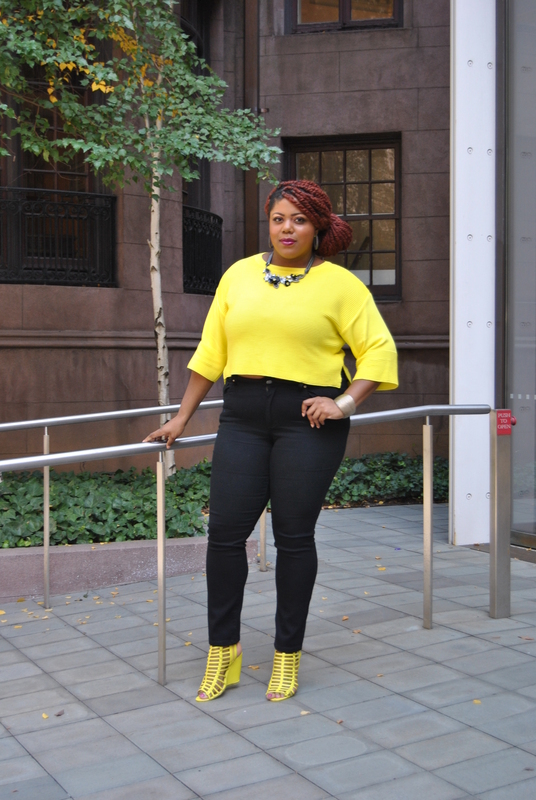 I paired my neon pop of color with a pair of gladiator neon wedges which were a perfect match. Don’t be hesitant to throw some color into your closet this fall! Next Post Orange is The New Black!